Star Turbine is the long-distance duo of Sindre Bjerga from Stavanger, Norway and Claus Poulsen from Copenhagen, Denmark. They have never met. Sindre Bjerga is a very active live musician, touring 2-3 times evey year since 2006 all over Europe, and have released more than 200 records, mostly known from the hyper-productive duo Bjerga/Iversen. Lately he has mainly been playing more solo gigs, including improvised voice as a new element in the mix. Claus Poulsen is a ”formal” multiinstrument musician as well as noise improviser and music producer, who enjoys working in very different music styles, and has worked for 8 years in Sound ensemble Alarm112, and now with Small Things on Sundays (amongst many other projects). Equilibrium is the condition of a system in which competing influences are balanced. 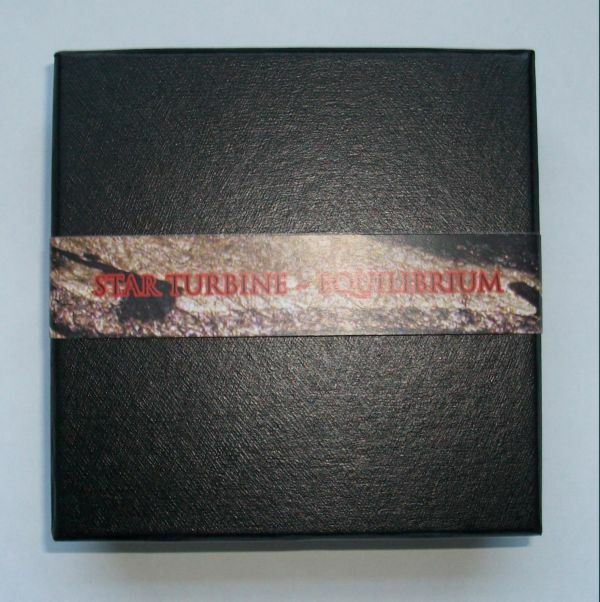 Equilibrium is also the first of Star Turbine’s work to be released – comes in a box with two 3” CD’s. Phase 1 starts off with a string of powerful drones rising in intensity, and Phase 11 , contrasting it with two longer ambient pieces – in equilibrium. A beautifully packaged object that will repay your attention many times over. Need I go on? ~ by STRIATE CORTEX on December 1, 2011. This entry was posted on December 1, 2011 at 10:57 pm and is filed under Striate Cortex Releases.You can follow any responses to this entry through the RSS 2.0 feed.You can leave a response, or trackback from your own site.